Planning to move from Philadelphia, PA to Phoenix, AZ? Phoenix is the largest city in the State of Arizona with a population of 1.5 million people. This city has perfect weather and is pleasant year round. It’s an amazing destination if you are looking for great shopping and dining, attractions for family, and outdoor activities for every taste. 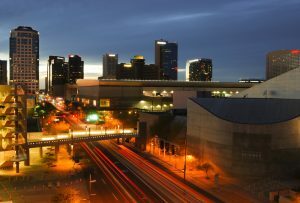 Many people find themselves in love with Phoenix and move to live in this fast-growing, dynamic city. If you are one of them, you should consider using vehicle shipping services to move your car. Our professional team will be glad to help you with your relocation and shipping your vehicle from Philadelphia, PA to Phoenix, AZ. There are over 2,300 miles between Philadelphia and Phoenix. If you are up for a road trip, be ready for over 33 hours of driving and all the expenses associated with the trip. It’s not merely gas, which will cost a lot. You might need to stay in a motel a few times, and that would not only cost you money but also your time. On top of that, you would add over two thousand miles to your car’s mileage and that would decrease your car’s retail value. Fortunately, with Philadelphia Car Transport, you can avoid all that and simply ship your car! Our team will be happy to assist you with Phoenix auto transport from Philadelphia. We work with all types of vehicles and provide door-to-door car shipping. Our car carriers have been through extensive training and will take care of your vehicle in the process of shipping. They also provide insurance to cover your car while it is in transit. Our agents will provide you with a free quote and all the needed information for your move. You can also request a quote online and we will reach you back as soon as possible.